We have many of the "Watch and Learn" products plus cases, strings. tuners, handmade oak footstools & more! Northern Pine Studios/School of Music has a 20 year record to prove it! 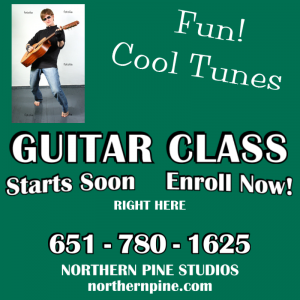 ​Beginning Group Guitar Class is loads of fun! Want to learn to fingerpick or flatpick and develop that professional sound? We have a special interest course for YOU! BEST ELECTRIC GUITAR OUTFIT DEAL EVER>>>>>>click here to see!!!! Buy With Confidence and SAVE !! Avoid mega guitar stores, department stores, and....yes, long distance online purchases and auctions. Always try to sample the instrument in person, if-at-all-possible. Physically SEE, FEEL, and HEAR your musical choice BEFORE purchase. A smaller, more localized dealer is better able to assist you with the ideal instrument for your needs - one that you can actually play and succeed on! What good is it saving a few bucks on a cheap sale if playing this inferior instrument inhibits your progress? Reject dealers whose bottom line is marketing guitars & banjos on a big box scale. Remember....a musical instrument is a personal choice, more like buying eyeglasses and shoes than buying a toaster or appliance. Ask Rick @ Northern Pine for advice- you can trust us! that instrument very uncomfortable and thus unenjoyable. anyway. 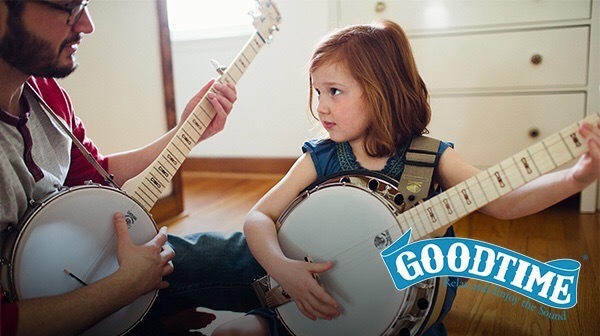 Sadly, often the bottom line trumps the kind of guitar or banjo you deserve. By the way , a well prepared instrument need not cost more either. There is a lot of good value on small name brands that are carefully set-up. 3. If the store/sales help cannot/will not tune it for you, then buy from a real music store that will. Please financially support the dealers who know their product well! 4. Buying right just requires a little knowledge,caution, and verification: it is actually fun!